When people talk about using activated charcoal, they may associate it with the charcoal that is used to fuel a barbecue. However this is not the same type of charcoal. Activated charcoal has many uses and health benefits and it is used for teeth whitening, prevention of gas, as a face mask, for detox as well as for other things. It has to be stressed that this article talks about the health benefits of activated charcoal, not the charcoal that is used for cooking with. You should never ingest charcoal that is not categorized as activated charcoal. Charcoal is made from a variety of materials such as wood, peat, bamboo, and coconut. Most activated charcoal that is sold for ingesting is produced from coconut. The charcoal is activated by heating it to very high temperatures of over 1,400°F and treating it with oxygen. This process causes pores to form in the charcoal giving it a large surface area. It is this porous surface which makes it a powerful substance to rid the body of certain toxins. The charcoal adsorbs chemicals and toxins. Adsorption is a process whereby elements are bound to its surface and then flushed out. Activated charcoal has been used for centuries to treat cases of poisoning and it is still used for this reason in many hospital emergency departments.1 Toxicologist, Ken Olson MD said that there is enough evidence from studies and case reports to use activated charcoal in selected cases of overdose.2 However, it is not effective if a person has swallowed corrosive substances such as alkalis, strong acids, or petroleum-based products. 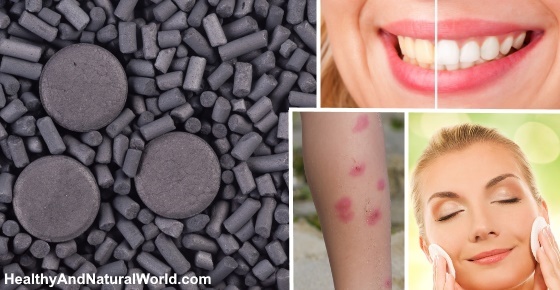 There are many ways to use activated charcoal to improve your health and well-being. Let’s have a look at some of them. One of the most common activated charcoal uses is for treating certain cases of drug overdoses. Activated charcoal is also good at helping to rid the body of toxins. You can use activated charcoal as part of a detox regime, by taking it as a supplement. To do this, you should take 10 grams of activated charcoal about 90 minutes before each meal. Do this for 2 days. And you may also want to educate yourself with the top signs your body is toxic. It may sound like a paradox, but activated charcoal is an amazing product to whiten teeth. Of course, at first, your mouth and teeth will be black, but this will rinse away very easily. The activated charcoal adsorbs plaque, tannins, and other toxins that can stain your teeth. You also benefit from better overall oral health because the activated charcoal balances the pH levels in your mouth and this can help prevent cavities developing, bad breath, and reduce the risk of gum disease. One word of warning – activated charcoal powder and the liquid mixture stains porous surfaces. Therefore, be very careful not to splash any of the mixture in the grouting between tiles and be very careful with your clothes, towels and other fabrics. Let’s have a look at how to use activated charcoal for teeth whitening. How to brush your teeth with activated charcoal – If you have charcoal tablets, crush one into a fine powder. If you have activated charcoal capsules, you can carefully open them and remove the powder. Dip a clean, wet toothbrush into the powder and brush your teeth as normal for around 2 minutes. Carefully spit out the mixture and rinse well. You may need to repeat rinsing a few times before all the activated charcoal is fully rinsed out. For best results, you can use activated charcoal to clean your teeth 2 or 3 times a week. Another option is to use activated charcoal while you are in the shower. The advantage of this method is avoiding the mess it involves. When you step into the shower, take your toothbrush and put some activated charcoal on it. Lightly brush the powder around your teeth, and rinse the toothbrush using the bathtub faucet. During your shower, keep the activated charcoal in your mouth. After your shower, spit the activated charcoal mixture directly into the drain. Rinse your mouth as many times as necessary to remove the black residue, or use your regular toothbrush to brush your teeth as usual. Further reading: You can whiten your teeth with another method which uses only 2 ingredients. Did you know that activated charcoal benefits your skin? The power of activated charcoal to remove toxins also works when it is applied topically. Activated charcoal doesn’t get absorbed into the body but it adsorbs bacteria, chemicals, poisons, and dirt from your skin. This means that activated charcoal powder can help, not just revive your skin and make it look younger, but it also helps to treat acne and relieve itchiness after insect and spider bites (if you suffer from mosquito bites you can also try these natural ways to relieve them). Did you know that one of the activated charcoal uses is for treating insect bites? If you have been bitten by an insect, mix one capsule of activated charcoal with ½ tablespoon of coconut oil and apply a small amount to the affected area. Remember to wrap the area with a bandage to avoid the charcoal mixture staining anything. You can also use the activated charcoal and coconut oil mixture as a first-aid measure if you have been bitten by a poisonous spider. Put some of the mixture on a piece of fabric which is large enough to wrap around the affected area. Secure with bandages and change the dressing every 2 or 3 hours. But you may also want to see your doctor. You can also make a great, revitalizing face mask using activated charcoal. Essential oils such as tea tree or lavender (or other essential oils for example essential oils for acne). But you don’t have to use all of the above ingredients – you can just use some of them to create the charcoal face mask paste. To make the face mask, put the dry ingredients of your choice in a small bowl and mix with the non dry ingredients such as aloe vera gel, coconut oil, or witch hazel to form a paste. Add a few drops of essential oils and mix again. Then apply the mixture to your face, avoiding the eyes, mouth, and nose. Leave for 20 minutes before washing off. Remember to rinse off carefully so as not to stain anything. A mixture of activated charcoal impregnated with silver has been shown to be effective in treating wounds and skin ulcers. In studies, it was shown that the silver effectively killed off the bacteria that had been adsorbed by the activated charcoal.3 This can help treat skin ulcers quicker and more effectively. Taking activated charcoal can relieve gastric discomfort caused by gas and bloating. For best results, you should take one 500mg capsule with a large glass of water an hour before a meal. Then drink another glass of water immediately following a meal. Further reading: if you suffer from gas and bloating, you can try these herbal teas which will work wonders on your digestion. Taking activated charcoal orally also has a beneficial effect on cholesterol levels. Further reading: you can also use apple cider vinegar to lower cholesterol, as well as this natural substance. Activated charcoal is generally safe to use and is only meant to be taken on a short-term basis. This is because it also adsorbs vitamins and minerals from the body and this can have a negative impact on health if taken over a long period of time. According to WebMD, in cases of drug overdose or poisoning, it is recommended for adults to take 50 to 100 grams of activated charcoal at first, followed by activated charcoal every 2 to 4 hours at a dose equal to 12.5 grams per hour. Each dose should be mixed with water. For children, lower doses are used (10 to 25 grams). It has been shown that dairy products like milk can affect how effective active charcoal works, so you should avoid taking the capsules with milk. As I’ve mentioned, activated charcoal is generally safe for use. However, there are some side effects that you should be aware of. One of the most noticeable side effects is constipation and black stools. Therefore, people with a slowing or blockage of the intestinal tract should avoid large doses of activated charcoal. Activated charcoal can also result in dehydration, so to counteract this you should drink plenty of water while taking activated charcoal. This also benefits your health because it helps to flush more toxins out of your body. Activated charcoal can also affect how other medications react with the body, so if you are taking medications it is best not to take activated charcoal capsules at the same time of taking your medicine. Activated charcoal (like this one) can be bought at many online stores. The best kind of activated charcoal is the type made from coconut shells. Some other good activated charcoal is made from wood, so read the label carefully to make sure you are getting the best type of activated charcoal. Some activated charcoal capsules have artificial sweeteners added, and these should be avoided. 2. J. Med. Toxicol. (2010). 4. Am J Gastroenterol. 1986 Jul;81(7):532-5. 6. Lancet. 1986 Aug 16;2(8503):366-7. 7. Scandinavian Journal of Gastroenterology, Volume 29, Issue 2, 1994. 8. Human Toxicology 1986 May;5(3):211-2. 9. University of Maryland Medical Center.